Dates associated with the GSTR-2. Auto-drafted purchase return - GSTR-2A. The GSTR-2 is a monthly tax return showing the purchases you’ve made for that month. When you make purchases from registered vendors, the information from their sales returns (GSTR-1) will be available in the GSTN portal as GSTR-2A for you to use in your GSTR-2. Before you file your return, you can check this information, make changes if necessary, and add any details that were not auto-populated. If you change the information on your GSTR-2A and file it as GSTR-2, the vendor will be notified and given a chance to amend their return using a GSTR-1A form. The purchase details of a specific month should filed before the 15th of the following month. For example, if you are filing GSTR2 for the month of March, then you have to file it before the 15th of April. Note: The council has relaxed the GST return filing dates for the first two months, i.e., July and September 2017 to facilitate the transition into GST. The last date for filing the GSTR-2 of August 2017 will be communicated by the GST council later. You must neither be a composition vendor nor have a Unique Identification Number (UIN). You should also not be one of those non-resident foreign tax payers. You need the data on your GSTR-2A from your GST portal. To cross verify this data, you need to keep detailed invoices for all of your transactions, including intra-state as well as inter-state transactions, and business-to-business (B to B) as well as retail (B to C) purchases. This also includes purchase transactions associated with exempted and non-GST supplies and stock transfers between your business locations in different states. The first section asks for the year and the month for which the GSTR-2 is filed. The following sections ask for the tax details from that period. 3. Inward Supplies from Registered Taxable Person other than the supplies attracting reverse charge: This information is automatically captured by the GSTN. It contains invoice-wise details of your purchases and inward supplies received including the GSTIN of suppliers, invoice serial numbers, invoice date, taxable value on invoice, ITC eligible and tax levied under different tax heads from your suppliers’ GSTR-1 returns. You can verify these details before accepting, rejecting, or modifying this information for filing GSTR-2. 4. Inward supplies on which tax is to be paid on reverse charge: Capture purchases on which you pay tax directly to the government on behalf of your supplier. The contents of this table are similar to table 3. If the supplier is not in the same location as you, you must provide the place of supply (the state where you received the goods or services). Invoice-wise details of inward supplies received from a registered supplier that attract reverse charge (you pay tax on purchases directly to the government). E.g., purchases made from silk yarn vendors. Details of purchases and inward supplies received from an unregistered supplier (which attract reverse charge by default). Invoice-wise details of services imported from overseas vendors. 5. Inputs/Capital goods received from Overseas or from SEZ units on a Bill of Entry: Rate-wise details of all goods that you have imported during this month. a. 5A. Imports: Details pertaining to bills of entry, including 6-digit port codes and 7-digit bill numbers. b. 5B. Received from SEZ: Supplies received from suppliers inside a special economic zone are treated like inter-state supplies and will attract IGST and in some cases may also attract a BCD (Basic Customs Duty) since they are treated like imports. 6. 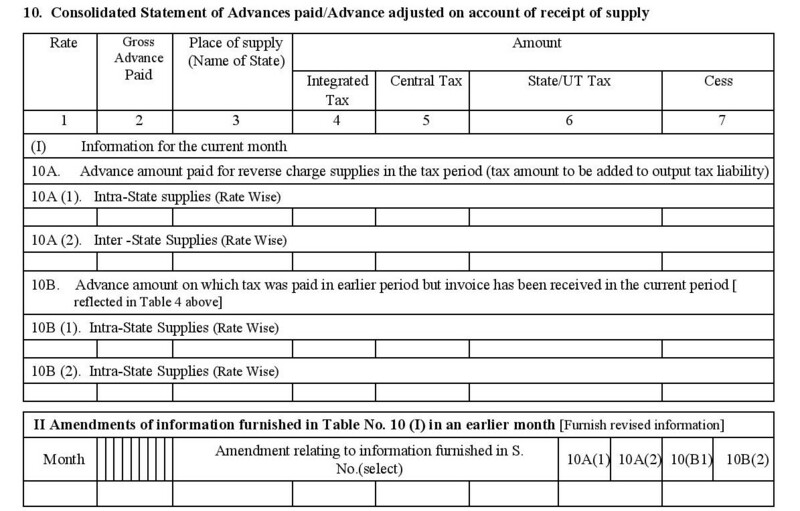 Amendments to details of inward supplies furnished in returns for earlier tax periods in Tables 3, 4 and 5 (including debit notes/credit notes issued and their subsequent amendments): This section can be used to correct or update the details of purchases and inward supplies that were recorded during earlier tax periods/months. 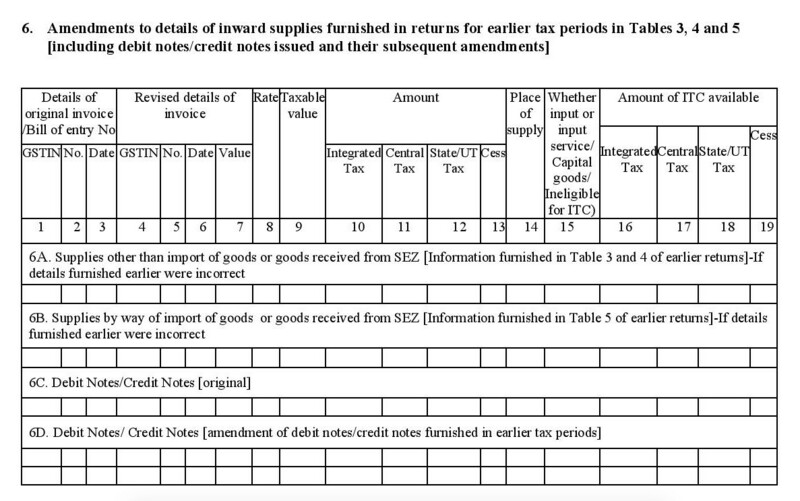 Corrections to details of inward supplies filed during previous tax periods, other than import of goods or goods received from SEZ (information furnished in Table 3 and 4 of earlier returns). Corrections to information pertaining to import of goods or goods received from SEZ (information furnished in Table 5 of earlier returns) is incorrect, you can make corrections to them under section 6B. Details of original debit Notes and credit notes issued to you during this month. Details of debit notes and credit notes that you provided in earlier tax periods (along with the details of the original document). 7. Supplies received from composition taxable persons, and other exempt/Nil rated/Non-GST supplies received: Under this section, you get to capture interstate and intrastate purchases made from composition vendors including exempt, nil rated and non-GST supplies from vendors at gross value. 8. ISD credit received: Details of the input tax credit that you have received from a registered Input Service Distributor or (ISD), (such as a your own head office that has transferred its ITC among all its branches). This data will be auto-generated when the ISD files the GSTR-6. Details of internal invoices sent to you by your ISD (head office), if any. Capture credit notes issued by your ISD. a. TDS Credit Received: Tax deducted at the source by your customer during payment for a transaction. This data will be auto-populated if the customer or recipient files a GSTR-7, and you’ll receive a tax credit for it. b. TCS Credit Received: The 1% tax collected and paid on your behalf when you sell your goods or services online through an e-commerce operator or marketplace. This data will be auto-populated when the e-commerce operator files a GSTR-8, and you’ll receive tax credit for it. 10. Consolidated Statement of Advances paid/Advance adjusted on account of receipt of supply: If you had paid advance tax on goods or services received during an earlier tax period, but only received the invoices this month, declare the details here. Advance amount paid for reverse charge supplies (of goods and services) that were received in the current tax period (tax amount to be added to output tax liability). Advance amount on which tax was paid in earlier periods but the invoice was only received in the current period (reflected in Table 4 above). 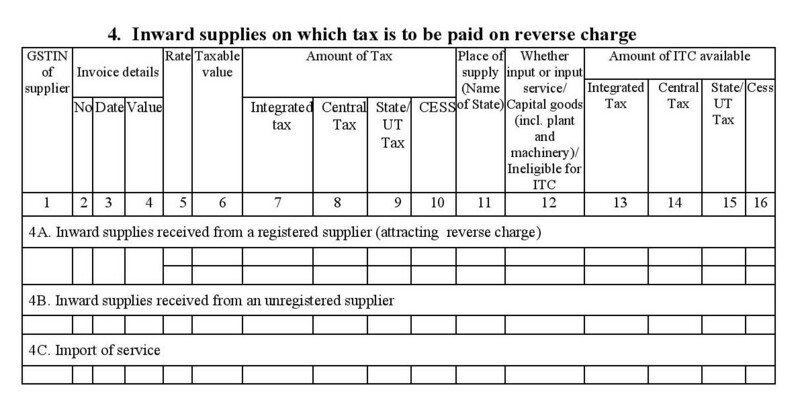 Capture all corrections and modifications made by you to transactions where you got the goods/services from the vendor(s) this month but the payment was made in advance by you before this month (basically any change made to the information furnished in Table 10 (I) of an earlier GSTR-2 goes here). 11. Input Tax Credit Reversal / Reclaim: Whenever you get a taxable invoice from your supplier, you will be eligible to claim ITC for the tax amount specified on the invoice, even if you did not make tax payments. You can avail this ITC only if you use these goods and services for business purposes. If they are used for non-business purposes, or for making exempt supplies, legally you are not supposed to claim ITC. Instead, you will be required to declare the ITC received to the government using this section. Here you are required to fill in details of your ITC that you cannot claim this month due to various ITC rules. (1) ITC Information for the current tax period. Under the GST law, you are required to pay your suppliers within 180 days from the date of issue of a tax invoice so that you can claim ITC. If you fail to make payments within this period, your ITC for that invoice will be reversed and you will be required to pay this amount to the government. This section captures such ITC reversals and this will be added to your output tax liability (the tax money you owe to the government). This section applies only to ISDs. If you are an Input Service Distributor, then the ITC amount reversed here is equal to amount of ITC you lost whenever credit notes were issued by suppliers to your head office. The amount of ITC reversed will be added to your company’s output tax liability (tax money you owe to the government). This tax liability has to be distributed from your head office to your branches in the same ratio as the credits were originally distributed. This applies to those who hire services to make both taxable and exempt supplies. While the taxable supplies are eligible for ITC, exempt supplies, and any goods or services that are used for non business activities are not eligible for ITC. We use this section to capture and return the portion of ITC that was given to you by the government on input services that were used by you (either fully or partially) towards exempt supplies and non-business purposes like self consumption. (d) Amount in terms of rule 8(1)(h) of the ITC Rules (to be added): This applies to those who buy capital goods to make both taxable and exempt supplies. The ITC reversal under this section works similar to the previous point (11(a)©). If ITC reversal amount declared by you (under point subsection 3 of this table) is greater than the ITC reversal amount for the same calculated using the formula laid out under rule 7 of ITC rules the difference is captured here. You are required to pay this difference to the government as tax. This subsection is the converse of the previous subsection. If the ITC reversal amount declared by you under subsection 3 of this table is less than the amount calculated using the formula specified under rule 7 of ITC rules, the difference is captured here. The excess amount will be subtracted from your output tax liability. (g) On account of amount paid subsequent to reversal of ITC (to be reduced): Capture the ITC reversed due to amendments made to supply documents for which you have already paid the difference before filing this return. This amount will be reduced from your output tax liability. (h) Any other liability (Specify): In this section, you need to capture details of all the ITC reversed or reclaimed for reasons other than those listed above. (2) Amendments made to the ITC information furnished in Table 11 in an earlier return: Here, you can make corrections to the details declared under table 11 of previous GSTR-2 returns. 12. Addition and reduction of amount in output tax for mismatch and other reasons: This section is used to capture any additional tax liability (tax you have to pay to the government) that arises due to the corrections made to the GSTR-3 of the previous month. 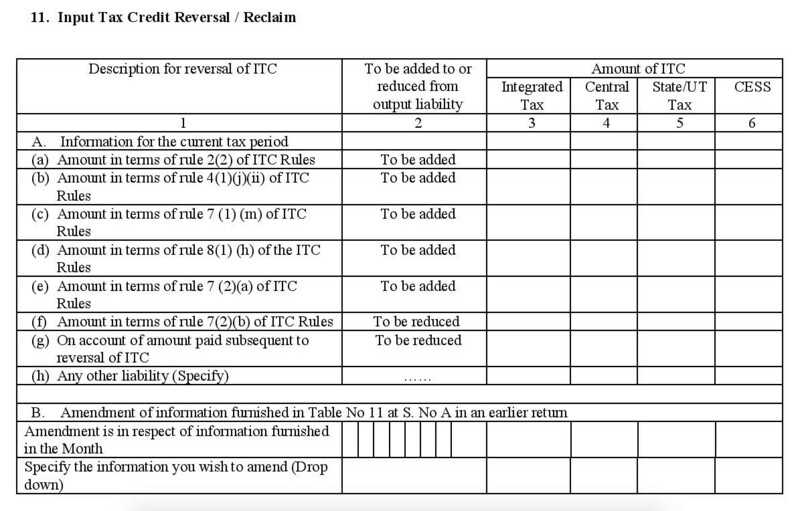 ITC claimed on mismatched/duplication of invoices/debit notes: The excess input tax credit that you may have claimed from duplicate purchase invoices have to be given back to the government. Hence this amount will be added to the tax you have to pay this month (tax liability). Tax liability on mismatched credit notes: Any incorrect submissions of credit notes that have been issued to you by your suppliers into the GSTN will also mean incorrect ITC values. Since you had corrected those mismatches in the previous month, you have pay the difference credits back to the government this month. Hence this amount will be added to your tax liability. Reclaim on account of rectification of mismatched invoices/debit notes (Reduce): This could arise whenever the correct taxable value on the invoice is less than the tax you paid against it during the previous month (due to a higher value mentioned on the incorrect invoice). And so, the excess amount will be deducted from your current tax liability. Reclaim on account of rectification of mismatched credit note (Reduce): Works similar to subsection c.
Negative tax liability from previous tax periods (Reduce): This could be due to any excess tax you paid during the previous months and this will be adjusted this month. 13. HSN summary of inward supplies - Provide an HSN-wise summary of the items purchased by you including total quantity purchased, taxable value under each tax heading, and Unit Quantity Codes (for imports). Note : If you are using a GST compliant accounting and tax filing software (like Zoho Books), then the GSTR-2 will be auto-generated based on the transactions you record in the software. You can then push, reconcile and file this return directly into the GSTN. There are 13 tables and sections under GSTR-2. While each one is meant to capture a particular aspect of your purchases and inward supplies made under GST, not all of them are mandatory for every business (except for tables 1, 2, and 13 which are mandatory for all businesses). Hence, we have come up with a list of applicable GSTR-1 fields for a few business models. The nature of supplies you receive. If you purchase goods and/or services from businesses who are also registered taxpayers then table 3 is really important to you. In case the registered supplier you buy from is a legal firm or one of the vendors mentioned under section 9(3) of the CGST law who is liable to be taxed under reverse charge, then table 4A will also apply to you. You can always make corrections to any incorrect data presented under tables 3 or 4 of previous GSTR-2 returns that you have filed using section 6A of the current GSTR-2 (this will not apply for the July return). Any credit notes or debit notes issued to you during a particular month will go under section 6C. Amendments to debit notes or credit notes issued during a previous period can be made under 6D. Depending on the type of item or service received by you from a registered vendor, table 7 may also apply to you (for reasons covered under the next subtopic). If you purchase goods or services from unregistered businesses or individuals, then section 4B of GSTR-2 will apply to you. If you import services from overseas vendors, then 4C will apply to you. If you are an importer of goods be it from an overseas vendor or from a supplier located inside a special economic zone (SEZ) then such purchases will be captured under table 5.
Corrections to incorrect data presented under table 5 of a particular GSTR-2 can be done using section 6B of subsequent GSTR-2 returns. If your head office is an input service distributor that makes purchases on your behalf, then table 8 will apply to you. Why do we talk about customers and sales channels in GSTR-2? Well that’s because, one of the main objectives of GSTR-2 is to keep track of the tax you paid to other registered persons who do business with you (and there by calculate the amount of tax refund that you can avail as credits). If you sell your supplies to a customer who deducts tax at source - the customer basically accepts the tax liability voluntarily and deducts that amount from the money he or she owes you, then section 9A will apply to you. The data under this section is sourced from the GSTR-7 of those customers. If you sell your goods and/or services through an e-commerce operator (like Flipkart or Amazon), then they will also collect an additional 1% tax from you (called TCS) and you get credit for this tax paid by you. This is tracked under section 9B and the data is sourced from the GSTR-8 of the e-commerce operators involved. Under the GST regime you can receive 4 kinds of supplies - Taxable supplies/GST supplies, Nil rated supplies, Exempt supplies and Non-GST supplies. You can learn more about each kind of supply here. Taxable supplies purchased by you are captured under tables 3, 4, 5, and 10. Table 7 keeps track of the nil rated supplies, exempt supplies and non-GST supplies received by you during this month. You have to use the items and/or services purchased by you to make taxable supplies to your customers including nil rated and zero rated supplies under GST (sale/production of taxable items or services). You have to use the items or services for business purposes - mainly for the furtherance of business like phone services for providing customer support to your clients (excluding those under activities mentioned under section 17(5) of GST Act 2017). What happens when you don’t meet the above conditions? Well, under the GST law, you are supposed to surrender the input tax credit received on items or services that you have used for non-business purposes, for carrying ut activities under section 17(5) of the GST Act 2017 and for making supplies of items and/or services that are exempted under GST. This is basically captured under table 11. You are also required to return the input tax credit that you may have received in excess due to modifications made to purchase transactions, duplicate purchase entries and mismatched transactions. This is captured under table 12. Failing to file the GSTR-2 for a particular month on or before the due date (15th of the following month will attract a late fee for everyday you delay the filing process. You will be fined Rs. 100 per day, up to a maximum of Rs. 5,000.